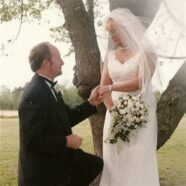 I purchased the gown in a little boutique type shop in Washington, North Carolina in 2001. I married Ron Jenkins in his home church in Milwaukee, North Carolina. It was a very simple wedding on Easter weekend. It was a beautiful April day. Ron was a musician, poet, and writer. My husband died of cancer last October and I’ve been cleaning out my house to sell it and move in with and take care of my aging and ailing parents. I love the dress and hope you can help me restore it to it’s original beauty. We were so happy to be able to clean and preserve Jenny’s wedding dress. It will help her preserve the memories of her husband. 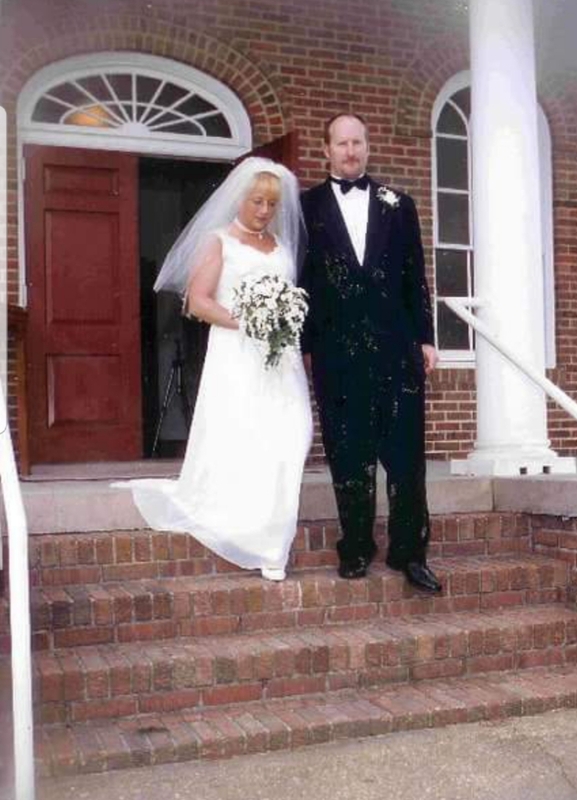 Jenny’s creme colored Eden Bridals wedding dress with organza appliques and pearls had a moderately dirty hemline and severe stains in the front, hem and the back of the skirt when we received it. The underarms, shoulders and inside the bodice were also stained. There were also a few burn spots in the skirt of the organza. We gave her dress a chemical pre-treatment and extensive cleaning and were able to restore it to pristine condition. Afterward we preserved it with Heritage Box™ wedding dress preservation. This will keep her wedding gown in the best possible condition and allow her to inspect her gown periodically and reminisce about her wedding day and her husband. Do you have a wedding dress that needs wedding dress preservation? Get a Free Quote today and get started. Jenny’s wedding dress BEFORE wedding dress cleaning. Jenny’s wedding dress AFTER wedding dress cleaning. 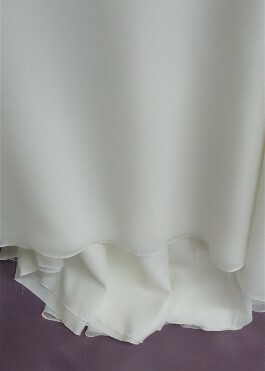 Jenny’s wedding dress hemline BEFORE wedding dress cleaning. 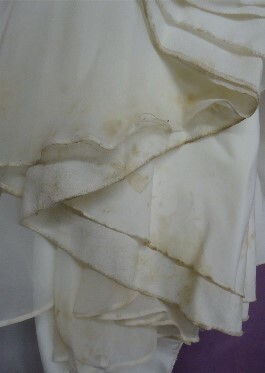 Jenny’s wedding dress hemline AFTER wedding dress cleaning. You did an amazing job! The orange rust spots were from the garment bag zipper. I was just heart broken when I saw it. You did an amazing job!!! Thank you so much for helping preserve this memory for me. You guys rock!!! I would highly recommend this service!! !